So far kimnilsen has created 4 blog entries. 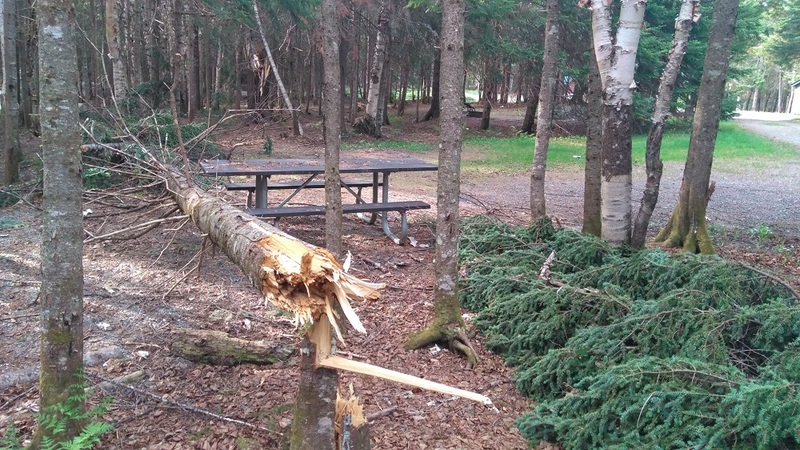 At this moment, Deer Mountain Campground in northernmost Pittsburg is closed due to storm damage that affects a number of campsites within the campground. There are a considerable number of blowdowns and leaners that have to be removed before the state facility can be opened for business. 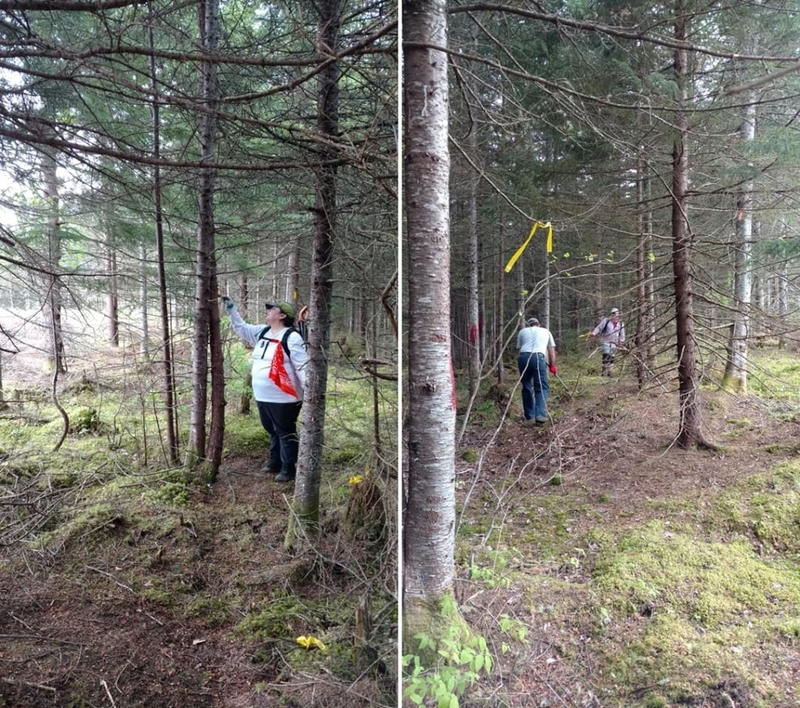 The Moose Alley Trail got a thorough working over on Saturday thanks to nine volunteers who showed up for the National Trails Day project to reopen the trail that was subject to a timber harvest last year. The trail is now open and well blazed in yellow paint. The spur path in from Route 3 into the junction of the Moose Alley Trail and the Falls in the River Trail is blazed in orange. The Moose Alley Trail and the Falls in the River Trail are part of the Cohos Trail system and are blazed in yellow. The Idlewilde Spur pathway from Second Connecticut Lake up to the lake’s boat landing access road has been cleared of storm debris all the way through. The big blowdown that fell between the Tillotson Shelter and its nearby composting latrine has been cleared away. The site is looking good up there in northern Pittsburg. The Round Pond Brook Trail has been cleared of blowdowns for about a mile from Route 3 north and west. More work to be done farther along. The Bald Mountain Notch Trail has just been cleaned up for the summer hiking traffic rush. New views are available in various spots along the Moose Alley Trail because of the logging operation. Most views are to the east to Mt. Magalloway, long Diamond Ridge, and Stub Hill (actually taller than Magalloway). A 100-foot spur trail may be brushed out at the top of Geronimo Hill to reach a clearing that would open a fine vista north to the Corkscrew Hills, Deer Mountain, Mt. Salmon, and Rump Mountain in Maine. The Percy Loop has been cleared of blowdowns. Our volunteer says he took out more than 20 trees with his Fiskar hand saw. A NorthWoods Stewardship Center trail crew has been at work of late on the Kelsey Notch Trail and the Gadwah Notch Trail. Our own volunteer has been hammering away on the Gadwah Notch Trail too. From what we hear, 75 blowdowns have been removed in that remote region of the Cohos Trail. 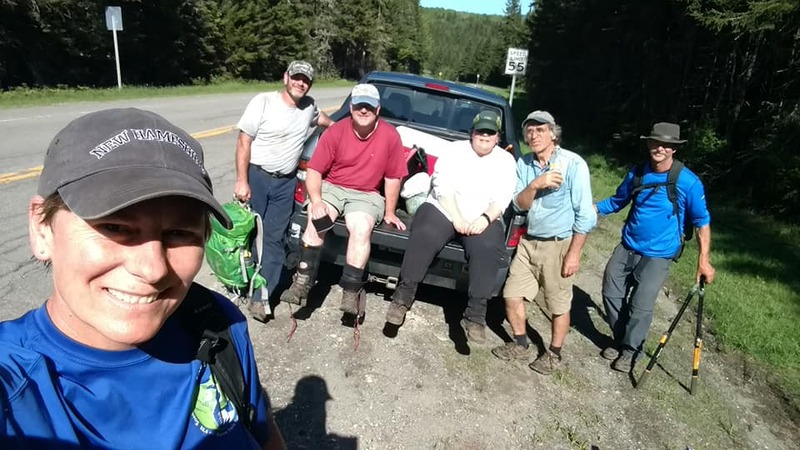 The NorthWoods Stewardship Center trail crew is moving south on the Cohos Trail now, working from Coleman State Park through the Tumbledick Mt. Trail to the Sugar Hill Trail, then up the Sanguinary Summit Trail to the Panorama Lean-to. They will spend the night there and then continue south along the long Sanguinary Ridge and clean the SST of blowdowns and debris. After that, it’s up to Pittsburg for brushout work on the Round Pond Brook Trail and the Mt. Covill Trail. The Cohos Trail should be in good shape by the time the hiking season begins in earnest, from Route 110 north to the Canadian border, and through Pondicherry Wildlife Refuge in Jefferson. The Cohos Trail Association has a number of critical projects on the agenda in 2018, projects that will substantially improve the trail and the ability to stay out in the backcountry under a roof. 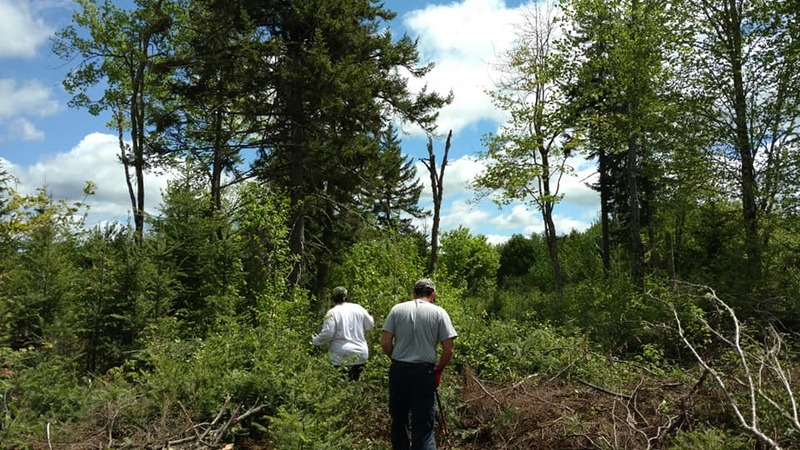 The all-volunteer trails group will also be utilizing contracted help to support the effort to clear extensive storm damage along scores of miles of pathway the length of Coos County, NH. So, that said, here is a look at some of the things you can expect on the Cohos Trail during the hiking season in 2018. In late spring, the association will construct its fifth lean-to shelter and attendant composting latrine on the Cohos Trail. In the community of Stark, just a bit south of the junction of the Jimmy Cole Brook Road (grassy old logging lane) and the Old Summer Club Trail, the new Devil’s Rest Shelter will be erected within the Kauffmann Forest, a delightful 6,000-acre parcel of protected conservation land managed by the Society for the Protection of New Hampshire Forests. The new shelter has already been milled out by the Garland Mill Timberframers of Lancaster, NH, the good folks who run the historic water-powered sawmill at the eastern margins of town. It will be somewhat similar in size and design to the existing shelter they helped create for us that resides on Sugarloaf Arm in Stratford Township. The shelter will be able to sleep up to eight individuals. It will be accompanied by a fine composting latrine fabricated by Jack Pepau, who lives in the nearby community of Stark. Jack and his son Chad (former president of the association) have fabricated many a composting latrine for the association and other trail groups. The location of the shelter will be about one-quarter mile south of the main route of the Cohos Trail (Jimmy Cole Brook Road and Old Summer Club Trail junction). The way to the shelter will be well marked so there will be no problem finding the facility. Once there, please be aware that campfires are strictly forbidden at the site. If you stay at the facility please use Leave No Trace practices and pack everything out with you, and we do mean everything. It will be possible after a long haul over the course of a full day to reach the Devil’s Rest Shelter from the Mount Cabot Cabin deep in the Kilkenny wilderness. There are no roofed shelters between Cabot and the site of the Devil’s Rest, but there are two formal campsites, one at Unknown Pond and one below Roger’s Ledge and near the junction of the Kilkenny Ridge Trail and the Mill Brook Trail. But for those who are hell-bent on sleeping beneath a roof, it will be possible to do so provided one puts in the effort to cover some seventeen miles between the Mt. Cabot watchman’s cabin and the new shelter. On Saturday, June 2, National Trails Day, volunteers will assemble near the Magalloway Road bridge over the Connecticut River and northward near Big Brook Bridge on Route 3 where the trailheads of the Moose Alley Trail are located. Once on site, two separate volunteer crews – one starting at the Magalloway Road trailhead near the Connecticut River and one a mile and a half north – will work to restore the Moose Alley Trail which was subject to logging over most of its length in 2017. The northern crew will clean up a small stretch at the northern end to the junction of the Falls in the River Trail, then rejoin the southern crew for the majority of the effort. Volunteers will have their work cut out for them removing extensive amounts of debris, cutting obstacles out of the trail, rerouting the pathway in places, adding blaze stakes and blaze paint throughout, filling skidder ruts, and the like in order to make the trail route passable and fully visible to the hiking public. The Moose Alley Trail is a critical link in the Cohos Trail system and restoring it is a high priority, indeed. Hikers moving along the trail will find most of the forest has been removed by logging and logging litter will be evident on all sides. There is one bit of silver lining, however. The timber cut opened up views in the region which were not available to the hiking public before. The association welcomes anyone who would like to participate in the effort to restore the Moose Alley Trail. To keep appraised of the project, go to Friends of the Cohos Trail on Facebook periodically and check in for upcoming information, or check our website. The Cohos Trail is, after all, located in places within working forests, forests that are cut to supply local sawmills, regional paper mills, and regional biomass energy plants with raw material to create products and generate power. The forest economy in the county makes it possible for huge tracts of forested land to remain undeveloped. These vast tracts of timber benefit more than industry. The trees provide a great regional carbon sink, habitat for countless animals and plants, filters for surface water to keep it clean, a wonderful recreational environment for many different users, and income for local citizens up and down the length of New Hampshire’s largest county. The Sugar Hill Trail south of Coleman State Park was also impacted (although less so) by logging in 2017. The association has contracted with the NorthWoods Stewardship Center for a crack pro crew to spend a day or two out on the Sugar Hill Trail cleaning up debris, reestablishing the route, leveling treadway impacted by machinery, adding blaze stakes and blaze paint, and generally making the trail suitable for hiking traffic. It is likely that the restoration effort on this pathway will take place either late in the first week or early in the second week of June. If you are planning on hiking the trail early in the season, you should expect to encounter this logging cut and the one that impacted the Moose Alley Trail. Be aware that the trails will not be reestablished if you hike early, so you will either have to backtrack, use roads of old skidways to get around the problem areas, or you will have to pick your way at your own risk through the cuts in much less than ideal conditions and without the aid of blazed trees. Extensive storm damage in the forests of Coos County, NH has prompted the Cohos Trail Association to contract for two weeks with a crew from the NorthWoods Stewardship Center of E. Charleston, Vermont, to thoroughly sweep the trail of blowdowns and debris, particularly in the vast mountainous region between Route 110 in Stark and Coleman State Park in Stewartstown, as well as lands where some trails reside in 300,000-acre Pittsburg Township. The Gadwah Notch area, more than most stretches of the CT, needs considerable work to make the route suitable for passage. In order to make the long trail route safe for hikers this year, the association felt it needed the help of a pro crew to clear the treadway over many miles. So when hiking season begins in earnest in July, the pathways that make up the Cohos Trail system should be well cleared of problems from Stark much of the way to the Canadian border. This effort has been made possible by an anonymous donor who has gifted the association with many thousands of dollars for the purpose of improving the trail and its infrastructure. The Cohos Trail is blazed in yellow paint throughout its entire distance north of Route 115, from Jefferson to the Canadian border. South of Route 115 the various White Mountain National Forest trails in the system have various colored paint blazes as anyone who has hiked the entire trail knows. Where we can influence the blaze colors, the Cohos Trail is blazed in that single yellow color. This year, we will make a concerted effort to touch up and add blazing throughout the entire trail system so that following the trail is easier than ever and less confusing in a few spots. We will also add additional signage and direction arrows to help hikers navigate the system, particularly in the area between Danforth Road and Round Pond Brook Road and the Round Pond Brook Trail in Pittsburg Township. We are asking all trail adopters to apply or touch up 2×8-inch blazes with yellow latex paint applied with 2-inch foam brushes along the route of their respective trails. Other volunteers will march out into the backcountry with paint, too, to touch up blazing on trails that have not been adopted. Please be aware that there are exceptions to the yellow color on spur trails that are a part of the Cohos Trail system. For instance, the Percy Peaks Trail is blazed in orange; the Deer Mountain Firetower Trail is blazed in blue. The Sanguinary Ridge Trail (part of the main Cohos Trail) also exhibits white blazes along with the yellow and has for decades. In some areas, old red logging blazes show up as do royal blue State of NH blazes. But the main path of the Cohos Trail is always blazed in yellow. If you have a yellow blaze in your face, you are on the right track. Please be aware that there are some trails closed in the White Mountains due to very recent storm and flood damage. Those closures do not affect the route of the Cohos Trail to any great degree. However, the Cohos Trail does use a very short segment of the Dry River Trail deep in the Dry River Valley. The main trail is closed. But the less than quarter mile segment that the CT runs on should not be problematical. If you have any Southbound Databook that is not the 2018 version, there is one glaring mistake that you must be aware of. In the beginning of the Nash Stream Forest chapter, it states that when leaving the Baldhead Shelter on Baldhead Mountain one should turn right to head south. That is incorrect. One should turn left (southwest) and head south. The new Neil Tillotson Hut shelter in the Connecticut Lakes State Forest was completed last year and is open to the public. There is now a place to camp legally halfway between Lake Francis State Campground and Deer Mountain State Campground. There is a new ADA (American Disabilities Act) compliant composting latrine 100 feet from the shelter, and there is water in a gulley very close by just to the north. In 2018, the Cohos Trail Association hopes to have a route laid out for a direct pathway due north out of Coleman State Park to link the park to the inlet bridges at 1,000-acre Lake Francis seven miles away. It is our hope that in 2019 we will be able to brush out a straight-shot pathway north so that we may eliminate lots of road walking and ATV-traveled corridors that the Cohos Trail runs on in the Deadwater region of Stewartstown and Clarksville Townships. Once landowner and state approvals are in hand, the layout work will be carried out by volunteers and by skilled individuals with the NorthWoods Stewardship Center. Their work will be underwritten by a $2,200 grant from the Neil and Louise Tillotson Fund, administered by the New Hampshire Charitable Foundation. Those funds will be used to explore terrain, GPS a suitable route, and flag it. An effort is underway to create a full-color, two-sided place card for tourist information kiosks all over the North Country and in State outlets in the hopes of increasing Cohos Trail exposure. The association has applied for a Coos Economic Development Corporation grant to underwrite the effort. If we are fortunate enough to procure a small grant, we will proceed with the design and printing of the place card and with providing guidebooks for local campgrounds and hotels. Appalled by two-mile-long lines of parked cars on the margins of North Country highways, piloted there by hikers who want to tramp the high peaks of the Franconia and Presidential Ranges? Who isn’t! The Cohos Trail is not too much farther north, you know. 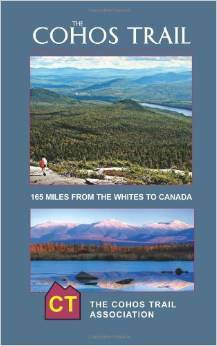 Hiking is wonderful in the Pondicherry Wildlife Refuge, in the Kilkenny wilderness, in the rugged Nash Stream Forest, craggy Dixville Notch, and in the vast Connecticut Lakes Region all the way up to the boundary peaks on the Canadian border. 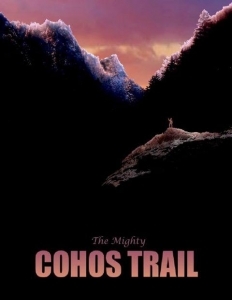 The mighty Cohos Trail is calling you north. Answer the call. Here are some things you should know right now about the Cohos Trail. The new Trio Trail and Pond Brook Falls Trails are open, eliminating 1.9 miles of road walking in the Nash Stream Forest. The Moose Alley Trail is closed right now (July 20) due to a logging operation. Signs are posted at either end telling you how to bypass the problem on Route 3 and the Magalloway Road. Logging took place on the recently opened Sugar Hill Trail south of Coleman State Park. You can get through the area if you take your time and look for the blazing that was not felled by the loggers in late 2016. The original route of the Cohos Trail — western leg of the Isolation Trail, Dry River Trail, Eisenhower Trail, are open after having been rebuilt a bit or rendered accessible again after closure five years ago due to Hurricane Irene. Check for ticks daily if you’ve been walking in grassy areas. 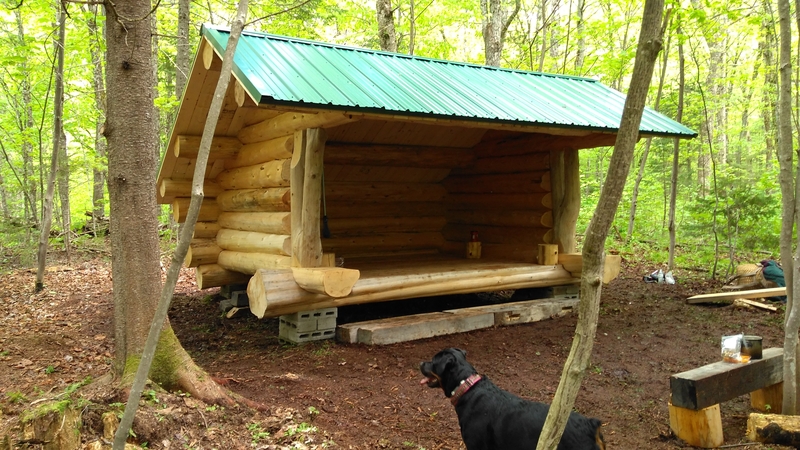 The new Neil Tillotson Hut lean-to shelter in northern Pittsburg, half way between Lake Francis Campground and Deer Mountain Campground has been completed. There is water nearby. A composting latrine is being built for the site but has not be finished and hauled into the shelter as yet. The Cohos Trail Association will likely build a second shelter in 2017, in the Kauffmann Forest in Stark, just south of the south central boundary of the Nash Stream Forest. This new shelter — The Devil’s Rest — will be one rather long day’s hike away from Mt. Cabot cabin in the Kilkenny and a half day’s hike away from the Old Hermit Shelter on Sugarloaf Arm in the Nash Stream Forest. The new Neil Tillotson Hut lean-to as it nears completion in northern Pittsburg township. Recently, a score of volunteers came out to help with the construction of the new Neil Tillotson Hut lean-to shelter in the Connecticut Lakes State Park in northern Pittsburg, NH, about 10 miles or so south of the Canadian border. Hikers may now camp legally between Lake Francis Campground and Deer Mountain Campground at the top of the state. A composting latrine has not been installed as of this writing, but will be before the hiking season ends.